As a researcher, Yong-Su Jin sees both science and art in his work. He sees science in the measuring, testing and theorizing. But in the creativity and passion that his field requires, he sees art. 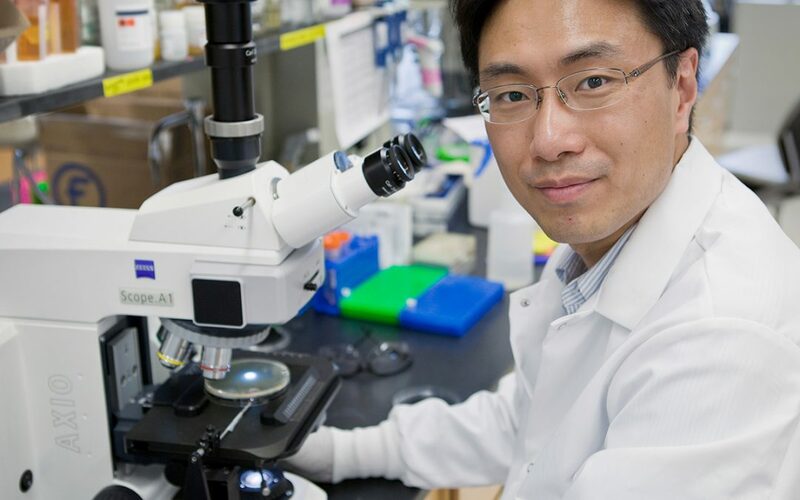 Jin is a Professor of Food Microbiology in the Department of Food Science and Human Nutrition at the University of Illinois at Urbana-Champaign and a member of CABBI’s Conversion Theme. Much of the research in his lab at the Carl R. Woese Institute for Genomic Biology (IGB) has focused on metabolic engineering, which involves altering microorganisms’ metabolic functions to create valuable products such as pharmaceuticals and biofuels. As Jin’s career has grown, so has the field of metabolic engineering. Over time, scientists started to look into what impact these changes have. Ideas from other fields, like systems biology and synthetic biology, became intertwined with ideas in metabolic engineering. Jin’s previous research has involved the production of human milk oligosaccharide, a unique sugar found in human breast milk. When ingested, microorganisms in the infant gut use this sugar as food, which leads to stronger gut development. Scientists were interested in overproducing this beneficial sugar in the lab, as it is only found in breast milk. Jin’s research showed this could be done in both E. coli and yeast by introducing an enzyme that resulted in the production of the sugar. “It’s a very interesting example of how metabolic engineering can contribute to society,” Jin said. Similarly, metabolic engineering will contribute to CABBI’s goal of developing economically and ecologically sustainable bioenergy solutions. The Conversion theme is trying to develop microbial strains that can produce molecules such as biodiesel and jet fuel. Jin is working on engineering yeast to produce organic acids and alcohols, two valuable products. As most of Jin’s research involves making metabolic engineering work, he finds himself interested in understanding the underlying mechanisms. He wants to learn more about how gene expression and metabolic pathways — the chemical reactions that are manipulated in metabolic engineering — are controlled. Jin compares it to a conductor guiding an orchestra. Though an orchestra might have all the right instruments and musicians, it is nothing without the control and guidance provided by its conductor. Metabolic engineering has a similar dynamic. Metabolic engineering has come a long way since Jin’s research began. Scientists have made significant advances, but more work is needed, especially when it comes to control. Again, he compares it to building an orchestra. Jin can relate this idea to his own career. He’s often felt frustration at the unknowns of metabolic engineering. But as the conductor of his own orchestra — his own research — Jin is happy to be learning.